I got my weeks mixed up but I think I'm back on track now with last week being week 8 of the year. We were Out and About more last week having breakfast with friends, getting in a hike on the one pretty day, seeing customers, and shopping. Also I got ready for stamp class. It was a nice change. I was beginning to feel like a hermit cooped up here watching it snow every few days. My favorite photo of the week was the one we took of ourselves looking in the new mirror. Several good pictures called for a two page layout - the first since Week 1. My challenge this week was to embrace the "white" space. That is really, really hard for me to do. I tend to fill up the pages so leaving that entire bottom half of the first page and top of the second page blank was super difficult. Still, after adhering the last embellishment to the right hand page, I forced myself to put down the stamps and scissors, back away from the table and leave well enough alone! To determine the size of the photos, I cropped and then arranged them in my photo editing software. 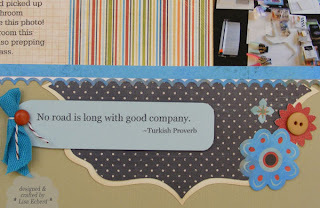 I added "In" and "Out" for the title, then printed and trimmed to arrange on a traditional page. 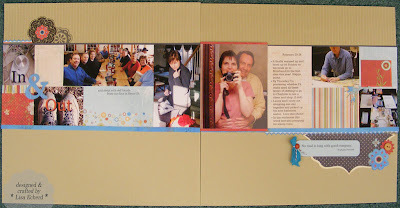 Mini journaling cards from an 8x8 Fancy Pants paper pad helped fill in some of the space between the photos. The black and white pointed square design was cut with the Cricut and Scal software using a design I downloaded from the Craft Edge (developers of SCAL) forum. The printing looks distressed and fits in with the paper but it actually either a dirty or faulty printer. Cleaning the printer goes to the top of my to-do list. 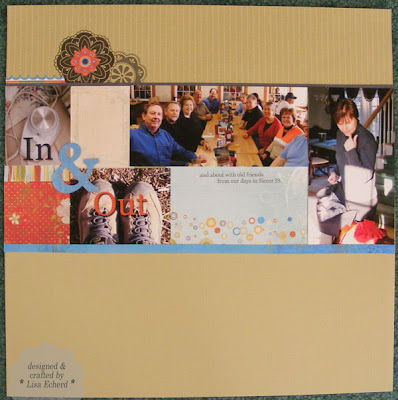 Ink: Basic Black, Basic Gray by Stampin' Up! 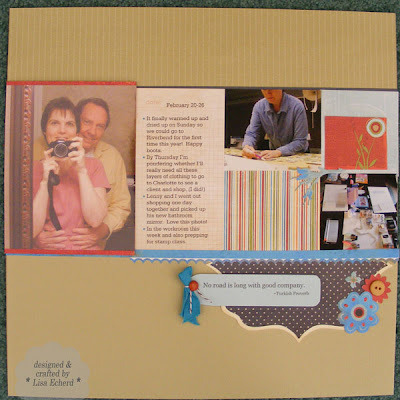 Cardstock: River Rock, Soft Sky by SU!